This is new equipment designed by Doug and Julie Glass. Doug started Verducci in 1997. He designed the Verducci Corsa, V-Max and V-Tek boots. These were the first boots I could put on my foot, right out of the box, and skate 20 miles the first day without getting a blister. He then worked with Powerslide in 2005 and came up with the good working Powerslide R2 and R4 boots. He then started Luigino in 2008 and created the good working Strut, Challenge, and Bolt boots. These are all incredibly good working boots. Now he's started Mota and is again pushing the envelope with the new Yolo Abec 7, Swiss and Ceramic Bearings. What sets YOLO apart? We're aware there are many brands to pick from so many good bearings on the market, where do we fit in? Before launching a new bearing brand to an over crowded market we had to come up with a way to separate our products from the others. We already know our brand sets us apart as its a the only bearing brand directly owned by skaters for skaters that live, eat and breathe skating 24/7. It's a brand that is attached to the owners lifestyle past, present and future. However, we know product quality and service is important. We're doing what no other bearing brand currently offers, All YOLO bearings (ABEC 7, SWISS, CERAMIC) are ultrasonic cleaned, pre broken-in, oiled, and packaged by hand at our HQ in Scottsdale,AZ. We are so confident in our Bearings that we offer a 30 day guarantee for anyone who is not completely satisfied. Simply return them for credit. Valid though all participating Yolo dealers. 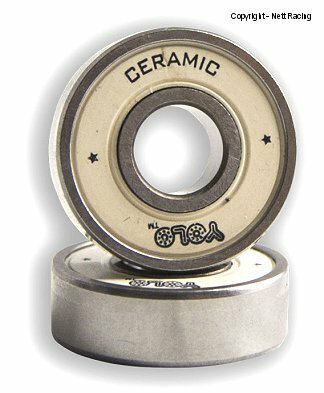 Precision ceramic balls made in Japan, Double honed inner and outer races, Deeper grooves specifically for skating, Nylon retainers, Non-contact rubber coated steel shields (one side) for easy access to clean and oil, YOLO lube Light Speed Oil.